Sen. Kamala Harris is "supporting the animals of MS-13." By Chris Nichols on Tuesday, July 3rd, 2018 at 5:52 p.m. 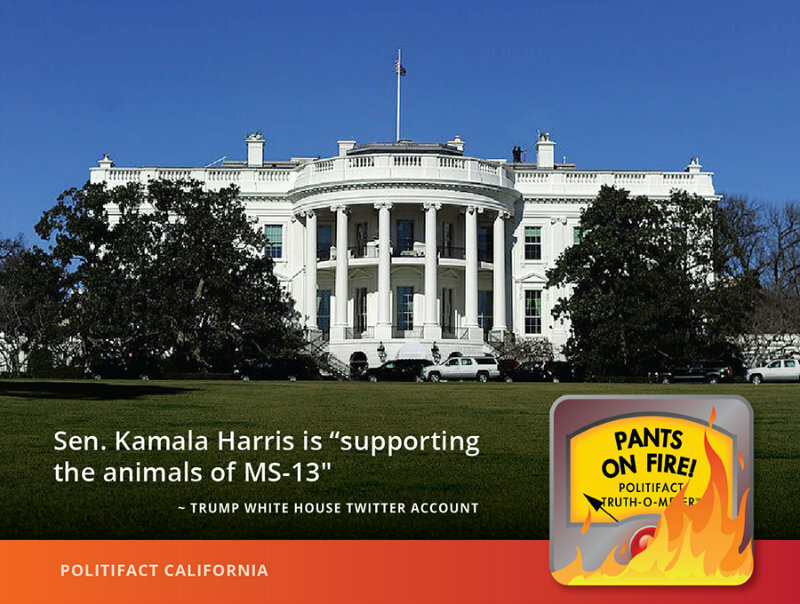 The White House made an inflammatory attack on California Democratic Sen. Kamala Harris this week, claiming on its official Twitter account that she is "supporting the animals of MS-13." It’s part of a pattern of attacks by President Trump and his administration on Democrats over immigration enforcement and the violent gang MS-13, or La Mara Salvatrucha. The gang grew out of poor Los Angeles neighborhoods where many refugees from civil wars in El Salvador, Guatemala and Nicaragua lived in the 1980s. For this fact check, we examined the tweet about Harris. We also reviewed similar attacks. "As a career prosecutor, I actually went after gangs and transnational criminal organizations. That’s being a leader on public safety. What is not, is ripping babies from their mothers." Harris was California’s attorney general and San Francisco’s district attorney before she was elected to the Senate in 2016. She is often mentioned as a potential 2020 presidential candidate. → Confiscated 500lbs of meth from a Mexican cartel"
We found no evidence Harris has ever supported or expressed any sympathy for MS-13. This is not the first rhetorical firebomb on MS-13 lobbed at Democrats by Trump or the White House. In a speech in May, Trump claimed California Rep. Nancy Pelosi "came out in favor of MS-13." PolitiFact found Pelosi hasn’t defended the gang and rated it False. Trump has repeated it in subsequent speeches. On the same day the White House tweeted about Harris, it also attacked Massachusetts Democratic Sen. Elizabeth Warren, saying: "@SenWarren, why are you supporting criminals moving weapons, drugs, and victims across our nation’s borders? You must not know what ICE really does." Democrats, including Harris, Pelosi and Warren, have criticized Trump’s policy of separating children from migrants and asylum seekers entering the country. They’ve also called for reforming, or in some cases abolishing, the U.S. Immigration and Customs Enforcement Agency, or ICE, and replacing it with a new agency. They have not, however, explicitly called for ending immigration enforcement. Nor have they made statements in favor of MS-13. "I think there’s no question that we’ve got to critically re-examine ICE and its role and the way it is being administered and the work it is doing," Harris said. "And we need to probably think about starting from scratch because there's a lot that is wrong with the way that it's conducting itself. And we need to deal with that." The White House attacked Sen. Kamala Harris for "supporting the animals of MS-13," in a tweet from its official account. Harris and other Democrats have sharply criticized the Trump administration for its immigration policies. They have expressed concern about how those entering the country, legally and illegally, are treated and called for reforming or replacing ICE. That’s not the same thing as or even close to "supporting" a violent criminal gang. We found no information showing Harris has supported or sympathized with MS-13. When asked, the White House provided no evidence to back up its reckless attack, which fits with a pattern of other baseless claims on the subject. 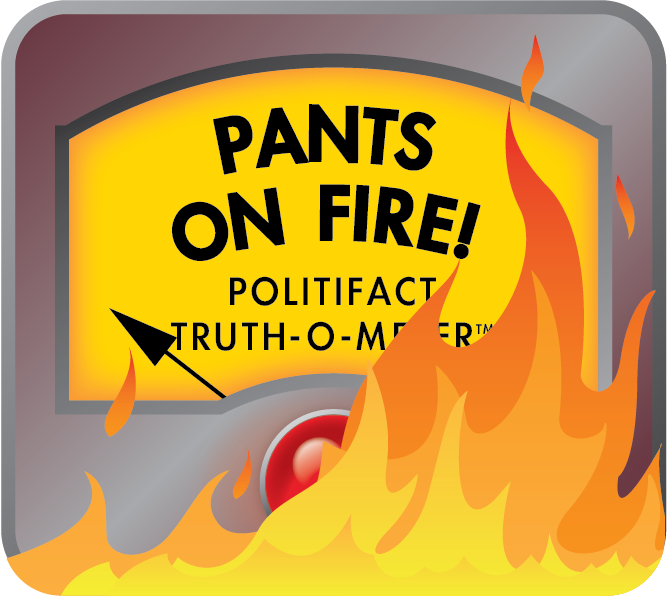 We rated the White House claim Pants On Fire. Published: Tuesday, July 3rd, 2018 at 5:52 p.m.